Cercis Canadensis is better known as the Eastern Redbud, also known as a Judas tree or Spice tree (more on that later). It ranges naturally from New Jersey to central Florida, west to Michigan and eastern Nebraska. A variant, the Mexican Redbud, ranges down across Texas and into Mexico. This official range is somewhat inexact, I have seen it as far west as Wichita County Kansas, north through New York state, and of course, it grows quite happily here in Connecticut (hence this entry). It is perhaps most spectacular in the mid-range. As a medium height, understory tree with a spreading and dramatic habit, it is spectacular in the spring in West Virginia and the Delaware Gap region; where it frames many roads, and in bloom is a vibrant pink spray of flowers against the rugged rocks and green river valleys, nicely complimented by the white dogwoods. It is not a tree of great height, rarely forty feet. It is, however, very fast growing (see below picture). But what it often does is branch near the ground creating a wide spreading tree with fantastic branches. The wood is fibrous and hard, but weak. The bark is an attractive red-brown. It withstands rot and is not bothered by partially torn limbs, which is good for ice damage is common. The pink flowers bud out along the branches in a unique fashion, before the leaves and last nearly a month. These flowers are followed by seed pods that look exactly like snow peas. Birds love them, especially chickadees and goldfinches. The green twigs can be used for flavouring game, hence the Spice tree. The flower buds can also be pickled for use as a condiment. The other name, Judas tree, more properly belongs to its European cousin, Cercis siliquastrum. This tree growing from the mountains of Israel up through Iran and Turkey, was historically known as the Judean tree. The corruption of that name may account for the name Judas tree. However, the more common legend is that Judas Iscariot hanged himself in a redbud. 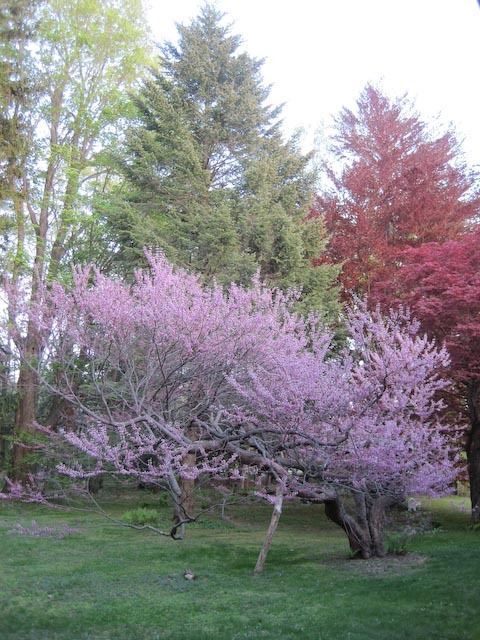 And so, Esperanza’s redbuds: the image at the top is the original one, planted c.1977. It was planted by my grandfather, Newman, who remembered fondly those in the Shenandoah and Ohio River regions, where his family was from. It has a sheltered location east of the house, with plenty of water. In recent years several young redbuds, volunteer offspring have been encouraged elsewhere. However, they do not prosper in areas on the property that have high wind loads, suggestings that this is a northern end of their range. Notably, those in the mid-west also tended to be in locations with lower wind loads. 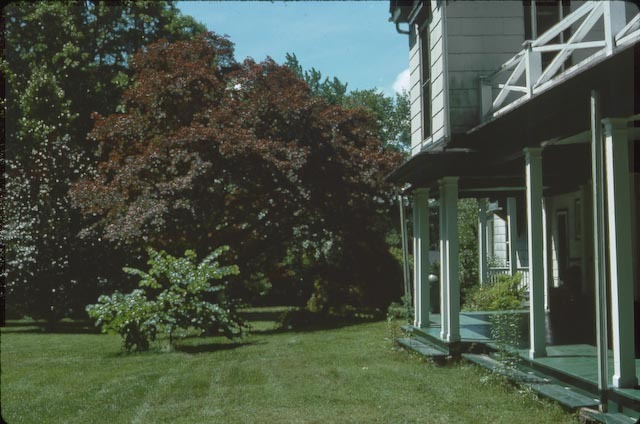 This picture, taken in 1978, shows it as a young tree. One of the benefits of the redbud is that it is a fast growing, disease resistant tree, that also happens to be extremely elegant. 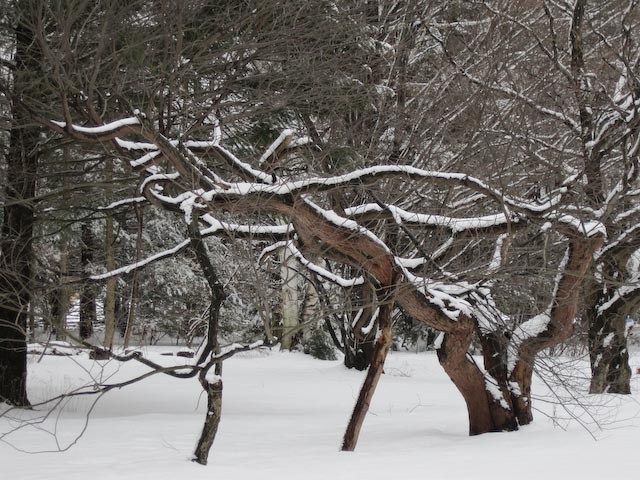 Taken last year, this shows its low branching and dramatic structure. Note the supports. There was a redbud in front of Grandmother Hall’s (Sudie) house in Marietta; one of the one’s Newman grew up with, I’d think. That was a good tall, straight-trunked tree as I remember it. And then there are the Western Redbuds all over the Southwest; the ones that pose themselves gorgeously against canyon walls in photographs. I had one of them – another very tall, straight tree – in my tiny yard in Albuquerque. There are redbuds here in the Bay Area too. Which particular variety I couldn’t guess. Perhaps the Western – but considering how many things have been imported to this area possibly another type. Relative heights! 🙂 I ought to have said that it was low branching, in that it would be rare to get a 16 ft straight, non-branched section and probably not an 8 ft section. It would either curve or branch. Esperanza’s original is definitely on the extreme side, the young volunteers are much more similar in style to the one you had and to the ones I have seen elsewhere. Although, interestingly, two of those volunteers had split trunks right at ground level, but they got turned into single trunks. I suspect if you started young, you could end up with a very elegant tree. They would be gorgeous against canyon walls. That is what I noticed in Maryland and West Virginia, I wish I had taken a picture of a roadside that was beautiful yellow stone outcroppings, with the flowering redbuds, there of course amongst the spring green.